Oh wow I went to ikea the other day and I saw this pinkish-gold vase pictured below. Then my heart fluttered and I started to drool. I have seen this vase in various blogs for about a year now and totally fell in love with it. Something about that pink color with the gold shimmering over it and the graceful bulb shape makes it so pretty to me. However, it seemed like it was only available in Europe! 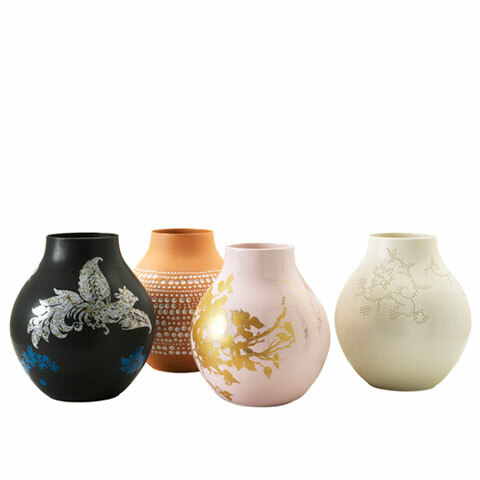 So it seemed like the vase would never be mine, but now it's here in the states and available in Ikea stores though I couldn't find it online at their website though it is on the designer's Hella Jongerius website. I have a birthday (a very big one) coming up though and I'm going to put this vase on my wish-list. Soon my pretty one you'll be mine.